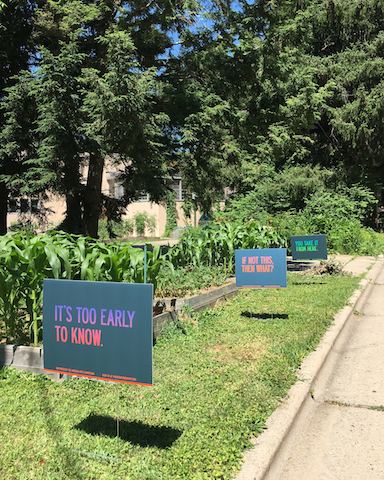 Yard signs with messages about community and belonging have popped-up around Madison as part of a Madison Arts Commission temporary project. The art project can be seen throughout Madison. The project, called “If Not This, Then What?,” was created by Madison artists J.L. Conrad and Trent Miller. Sponsored by a Madison Arts Commission grant, Conrad and Miller, who are married, have given out over 200 signs for free so far since the project debuted in July. Miller said he and Conrad chose the three phrases because they were the most open-ended and thought-provoking. Miller said that they executed the project through yard signs because of their personal nature. Madison residents picking up their yard signs at a local library. The artists hosted three different pick-up events for people to get signs in July and have also shipped signs across the country. Though Miller said it’s up to individuals to determine what the signs mean to them, he said the lead sign, “If not this, then what?” best portrays the point of the project. According to Miller, the project is just the first in a series of art projects that he and Conrad are working on. In addition to scaling their project up, Miller also said he and Conrad were working on developing new phrases as well. 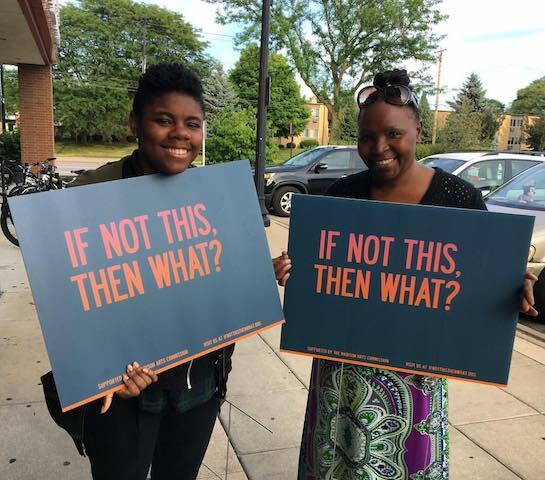 Whether it’s via a yard sign, in a newspaper, or on a billboard, expect to see more signs on community and belonging around Madison soon.